Pregnancy. The Outdoors. Being a Mom. Can the three all mix? I'm not going to lie, it was difficult at times to even get out the door. With two kids in tow already, an ever growing pregnant belly and the fact that I just wanted to sleep, heading outdoors didn't seem as enticing. As usual the rewards of heading outdoors, especially during pregnancy always made me better and I can honestly say I never came back saying "Well I wish I hadn't gone outdoors!". Yet here are a few pregnancy confessions this outdoor mom would love to share with you. NOTE: I am not a medical health professional but these are my own personal observations and suggestions based on my three HEALTHY pregnancies with the approval of my personal doctor. Before I became pregnant I was hiking, running, biking and lifting weights, but as my pregnancy progressed I slowly had to stop doing certain activities or reduce the intensity of these activities. By the end of my pregnancy I was left with light hiking and walking but I vowed that I was going to stay active, especially in the outdoors. In my first trimester biking with the kids. My confession is that once the pregnancy hormones hit the fan, I just wanted to take a nap but there was always a force driving outdoors. Most of the time it was my kids needing to go outside so they could run around like wild animals or the fact that I needed fresh air because every smell in my house made me want to vomit. Whatever the reason even though I just wanted to nap, staying active outdoors was one of the best things I did in this pregnancy. I had stopped hiking around 36 weeks but I continued walking EVERY day between 1-2 miles. For more details about hiking while pregnant, please visit my post on Backpacker Magazine, "Bun in the Oven: Pregnant Hiking". Confession #2: The Aches and Pain ~ Everything Hurts! Everything hurts more when you are pregnant, so when you mix an outdoor activity it is hard to admit but every little joint hurts more than normal! Plus it takes longer to recover even from short hikes due to the "wonderful" ligament laxity that is produced during pregnancy. Whether I stayed home or headed outdoors everything still hurt, so Tylenol was my best friend. Early in my pregnancy I continued road biking, but as my belly got larger different areas of my body started hurting more than I could take and sadly I had to stop biking in my second trimester. Oddly enough, hiking and walking helped minimize the swelling in my hands, feet and other areas of my body. Even though it took me longer to recover, I felt the "good" soreness of a workout and swelling was almost a non-issue in my last pregnancy. I'm not a really emotional person, but pregnancy changes everything. It's those pregnancy hormones that make you worse than a Bridezilla. Just kidding. But only sort of. I just wanted to cry some days, whether it was because of a stupid sappy commercial, my kids driving me insane, or simply the fact I couldn't see my feet anymore. The outdoors helped regain my emotional stability on days when pregnancy, motherhood, and just plain life seemed like a big blur. Personally, the outdoors is my time I spend talking with God, my husband and kids. It sets the scene so my emotional status can get in check. So on days when I felt like crying, I headed outdoors to get perspective on things and I always came back with a smile on my face. Giving birth for the third time was easy, like to the point where the baby practically fell out of my body. Waiting for the labor to actually start on the other hand was not easy. I was 38 weeks pregnant and just miserable, everything took four times as long to do and I was constantly scared of peeing my pants in public. Whether because I was actually going to pee my pants or afraid that water was going to break. I was to the point where people just stared at my huge belly...I was "scary" pregnant. My husband had decided that it was too much for me already to deal with our two kids and life so he decided to stay home until after I gave birth. I remember a few hours before I went into labor, we were driving home from my son's preschool, I cried and prayed to God that I'd go into labor that night. As usual, I had fake contractions the rest of the afternoon, but I distracted myself with housework due to the ferocious "nesting" stage I was in. I was cleaning the house....I even had this urge to clean the windows on the outside of the house. I just needed to do something, I wanted to go for a run but I just physically could not. The "fake contractions" continued even through a video conference call I had for Latino Outdoors and we joked about that I might be in labor. Later that night, after the kids went to bed, my husband and I were watching TV re-runs, when I finally admitted to my husband I thought I was in labor because things were getting a little painful. I stretched, laid down a towel on the couch (thank goodness) before I decided to spend the rest of the night on the couch. I sat down on the couch and immediately my water broke. After that it was kind of a blur, but the women from my familia came over (and my dad) and we headed over to the hospital. Our beautiful baby boy was born before sunrise! Medicine: I went into labor naturally but I didn't want to feel ANY pain so I had an epidural and the lowest amount of pitocin to get things rolling. Labor: I pushed the baby out in ONE push. It took longer to prepare the room than to get the baby out. Recovery: My recovery has been amazing. More to come on this but I was released early from the hospital and it's been a faster and better recovery than my previous births. I confess, I'm so glad I'm done being pregnant but I will always cherish the lovely outdoor memories and adventures I had with this pregnancy. The love of the outdoors starts from the womb and I know this little guy already loves it. Confessions are good for the soul, especially pregnancy confessions! Leave a comment below with your pregnancy outdoor confession. The Family of Four Hikers is Growing to FIVE! "Sleeping Under the Stars" Family Project Completed! I had a rough week. Granted this might be a whiny post, "get it off my chest" type writing but that is how I like to express myself. Feel free to scour the rest of my blog and ignore this post. My family loves the outdoors and sometimes we like extend my husband's business trips to mini outdoor vacations. I am fortunate enough to be a stay-at-home mom to our two toddlers so we occasionally tag along on business trips. My kids love traveling and if they are home for more than a week they ask to "go to their new house" aka hotel or "go build a tent." This week we decided to extend a business trip and explore Orange County, Southern California - aka The OC. My kids are normally champs when it comes to traveling but this trip was a little rough on everyone. More details on our actual outdoor adventures later but first I need to get stuff off my chest about my traveling debacles this week. Transitions: Transitions were a constant battle during our Orange County trip. When we had to say goodbye to daddy so he could work, getting our car rental and checking in at the hotel was just awful. I was alone with two cranky toddlers, a large suitcase, a backpack, two car seats and had to walk all over the airport and hotel. A stranger at the airport saw how much I was struggling and felt so bad he helped me carry all my gear. Why didn't I get a cart? Well I just didn't think about it until after I had lugged all my stuff into our rental. Sickness/Migraine: My kids had a little cold, I mean really weak cold but throw in travel and probably not sleeping enough exasperates everything which probably perpetuated meltdowns. I'm prone to migraines and the perfect migraine storm occurred, so I spent a portion of a day in "migraine mode." If you are a parent and have migraines screaming little ones don't really help alleviate your migraine pain. Thankfully, my doctor has prescribed me a migraine medication that 99% of the time helps my migraines disappear. Theft: Someone in a coffee shop stole my Nexus 10 tablet. Seriously. I doctored my coffee, sat my kids down outside with 10 things in my arms, realized I had left my tablet inside, ran in and it was gone. There was only one person gone after I ran outside so I'm assuming it was him. I tried to keep my tears in but ended up crying like a baby when I got to my car. My kids haven't really seen me cry and were very worried that I had injured myself. I explained that Mommy was sad and they showered me with hugs and "I love you." I just needed to vent and get over the fact that it was just a thing. Hotels: I love hotels but they stress me out as a mother. It resembles too much like a home where my kids know they can watch whatever show they want. Unlike our home, hotels have regular TVs with a weird thing my kids don't understand: commercials, that don't always show their favorite shows... Also so many sharp edges and shiny things for my kids to break. I share many of the same views on Camping vs. Hotels that Mae of Mommy Loves Trees talks about! I love traveling and fancy hotels but by the time we left Newport Beach I was ready to be outdoors, on the foothills of Saddleback (Orange County). It's not always sunshine and roses when traveling with kids, but we do it because we always like to have our family together. My husband has been told on many occasions by his co-workers that they are jealous that we are able to join him on business trips. We love traveling but that doesn't mean it is easy because the matter of fact its not, even for an "experienced family travelers." What do you dislike the most about family travel? Especially traveling to get outdoors with the family? Pedal, Brake and Balance: My Boy Can Ride! My boy learned to ride a bike this week! He did it the "old fashion" way with training wheels. He started riding a bike around his second birthday on a crappy hand-me down bike (training wheels) with rust on it. He received a balance bike as a birthday present but he wasn't tall enough to ride the balance bike right away, so he continued riding on his rusty bike. We tried and tried the balance bike once he was tall enough but my son really likes to "be like daddy" and wanted to pedal. Frankly, I just wanted him to burn energy so we let him learn to ride a bike the old fashion with training wheels. First he learned to pedal then steer, then a few months ago he learned braking as well as riding fast! Two years later on his bigger new Giant Animator Bike, on a sunny afternoon he decided to ride his bike. 2.5 hours of crashing in the bushes and falling off his bike, my determined little boy learned to ride a bike with no training wheels. He turned to me and said, "Mommy! Now I can Pedal, Brake and Balance!!". Lots of joyous yelling, double high-fives ensued and we even had a cake later in the day. This isn't a pro-training wheels nor a pro-balance bike post but a "have fun learning how to ride a bike" post! I never thought I'd have the same feeling of excitement as when I saw my baby boy take his first steps, but this is as exciting as his walking milestone except that he joined in the celebration! Pedal, brake and balance! How did you feel when your little ones learned to ride? Outdoor Families! This #OutFam Twitter Chat is for You! One of my main purposes of starting Chasqui Mom blog was that I wanted to help other families whether new or experienced outdoor families, enjoy the outdoors. Low and behold, a year and a half later and thousands of tweets later I have made so many connections with other outdoor family bloggers! An amazing group of outdoor family bloggers has come together to share their expertise in a new Twitter chat focusing on outdoor family adventures. We've been sharing our stories and insight through the #OutdoorFamilies hashtag for awhile but now we're taking the next step and opening up the conversation through the chat-friendly hashtag #OutFam. Not only am I thrilled to be a part of this group, but to be able to connect these inspiring adventurers from all over North America is a true testament to the power of Social Media. I hope you'll join us on Twitter to share your ideas and experience as well as learn from this collection of adventuring families who really know their stuff. Whether you're a seasoned pro or just starting out, there will be something for everyone. Each week we will be having a different topic related to the families being in the outdoors but for our inaugural #OutFam Twitter chat, I'm happy to announce that I have teamed up with the great outdoor family blogger, Val in Real Life to talk about "Love of the Outdoors". How do you participate in #OutFam Twitter chat? Join in on the conversation! Every Wednesday at 4:30 pm EST/1:30 pm PST (30 minutes) starting February 12th. Until then, please share with other families about this great new chat, #OutFam. If you have any questions please leave a comment here. You can also join in on the conversations on Chasqui Mom's Facebook, Instagram and Twitter that is updated daily with outdoor activities and other wonderful posts and links from #OutdoorFamilies! This is a little bit of a rant, joke and plain honesty about my life of an outdoor mom. Just like any first time mom I read all the books, tried my best to do everything in the "correct" way with my kids but let's face it, I just do what I can to survive with two toddlers. A lot of people think I have always been outdoorsy, but as a matter of fact most of my life I've been a "Mall Rat". My toddlers have actually molded me to be an outdoor mom because of their personalities. I have been blessed with one SUPER energetic child and another child that LOVES getting dirty and being outdoors. Over the last four years of my new life of motherhood, my children have pushed me into embracing the outdoors even more (for my sanity) and with that here are my confessions of an outdoor mom. Confession #1: "Mall Rat" converted to "Gear Junkie"
I used to spend hours and hours on end at the mall (prior to marriage/kids) shopping for clothing, shoes (stilettos in particular) whatever I could find on sale. I still have that shopping tendency but now at our local outdoor gear store. I mean the employees ask about our kids all the time. From backpacking, camping, hiking and our recently added family outdoor activities of rock climbing, snowshoeing and biking means more gear for the family. My mall rat persona was more selfish in nature but my gear junkie habits are for the family. I'm always on the search for outdoor kid clothing and gear that I love getting on Super Sale. I'm a sucker for sales. Don't get me wrong I love playgrounds, a good portion of my childhood memories are at playground parks but my kids always end up leaving in tears because they don't want to leave or they have some other playground drama. I prefer to take them to the trail where nature is their playground, we sit by a creek or lake and they can entertain themselves. Smaller less popular and visited playgrounds, where I can keep my eye on both. Make playground dates with my children's friends to avoid less playground drama. Go during "school hours" to avoid the after-school playground rush. Visit on chilly days because it tires my children quicker and there are less people. It's sounds awful but in my Latino culture kids drink coffee....well more like "Cafe con Leche" with sugar. I remember my parents giving me some growing up and I wasn't addicted as a child but now I am... It's more difficult to prepare coffee than chocolate when backpacking with only a restrictive amount of cups, so I just pass my "Cafe con Leche" along to my little one. My daughter is a huge fan of coffee, my son is not since he's just "naturally caffeinated!" I confess I have given them caffeinated soda, chocolate covered coffee beans as well as tiny dregs of my energy shots so they could finish hiking. Mother of the Year award, thank you very much. Please don't call CPS on me. I have a picky toddler that sometimes doesn't eat for days, so when he asks to give him food to eat, I do! He loves blackberries and when blackberries are plentiful along the trail, we pick and eat them. He's actually learned to identify blackberries and looks for them every time we hike! The land's original inhabitants are no longer eating them....that's how I justify it. I pick wildflowers for my daughter. She loves flowers, absolutely loves flowers and sometimes it's the only way to stop her from crying on the trail. One time while backpacking she yelled half asleep "STOP!!! I see flowers!!" as we walked through a wildflower field. I just make sure she leaves the flower back on the trail so the seeds can be re-planted in the same general area. Gross Factor Confession: I clean up after my kids messes all the time and when I see other people trail trash I will pick it up 99.9% of the time, except on one occasion. While hiking at a National Park, I saw a wet, dirty men's underwear on the side of the trail, I'm sorry but that's where I draw the line. Why would ANYONE do that?!?! Someone else can clean that up. Gross. Period. I confess, I escape from my house to the outdoors because I don't want to clean up sometimes. I could tell you why, but Alyssa from The Kid Project beautifully explains my feelings exactly in her post "I am a Half Dirtbag Mommy". I'm not the only one but it is still my personal goal to try my best to clean up! Check out other great Outdoor Parents Confessions! Jen of Adventurous Moms confesses how she's a little bit squeamish of creepy crawlers. Sometimes little trail meltdowns happens as Jennifer of Mommy Hiker experienced. It's ok! I love Family Adventures in the Canadian Rockies brutally honest confessions of being a "far from perfect mountain mama". Tanya's confessions are some that I've experience first hand too. "On occasion I've failed to notice the clothes my boys had picked out for a day in the mountains. When we went to Chester Lake in the fall, I didn't notice that they were in shorts on grey [rocks] close to zero temps until we started hiking. One of the other dads said something about my sons being true Canadians or something..." confesses Ken of Big Grey Rocks. No one lost any digits to frost bite! Amelia of Tales of a Mountain Mama confesses "I get outside for ME first. I am a terrible mom if I am stuck inside all day and therefore I see it for their benefit too. Oh and everyone drives me CRAZY inside - it's all just a sanity thing!" "I'm a stay at home mom but that doesn't mean I stay at home" says Alyssa from The Kid Project. Gayle of Sometimes Eventful confesses that she likes to think outside but also likes "chocolate mixed with reality TV every now and then". Chasqui Mom is also a fan of the certain reality shows! In The Adventures of Parenthood Project, Meghan talks about "The Transition to Parenthood: 5 Things I Didn't Consider." I have many more confessions that will come in some other future posts but until then these confessions are why I love being an outdoor mom. No one is perfect, we are all "work in process", what I'm learning is to follow my instincts to keep my household happy both on and off the trail. Confessions are good for the soul! Leave a comment below with your outdoor confession. Thanksgiving is the season of reflecting on what we are thankful for and I'm endlessly thankful for ALL the aspects of my life but here's a little list of what this hiking mama is thankful for! 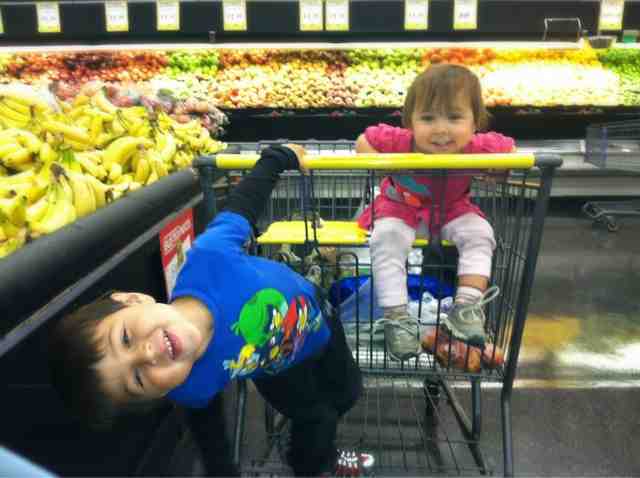 My crazy energetic son and my dirt loving daughter, truly push me to go enjoy the outdoors with them on a daily basis. You might think many of our crazy adventures are my ideas but in reality the majority of the ideas are from the great guy I married! I might be "Chasqui Mom" but he's truly a mountain man that loves the outdoors! The East Bay Regional Park District (EBRPD) is this family's hiking ground! With 65 parks, 98,000+ Acres, 1,150 park trail miles, 3,789 picnic tables, 13 water features, and 277 camping sites, who says you can't enjoy the outdoors in the urban area of the East Bay-San Francisco Bay Area!! Every outdoor adventure with toddlers is hard but this year has brought a ridiculous level of "Hard" on our outdoor adventures. From extreme heat, below freezing temperatures, howling winds AND coyotes, sickness and wildlife encounters, you would think I would want to give up. I'm not going to lie there have been moments when I cried and lost it on the trail but all those moments have passed and I have been left with a stronger love and motivation to continue going to the outdoors. Nature can be found everywhere, you just have to learn to find it all around you. I love open fields surrounded by mountains but Nature is all around us from a little lady bug flying around in your backyard to the mountainous Rocky Mountain National Park. We just have to learn to see it and I thank God for creating such a magnificent place for my family and I to enjoy forever! A few weeks ago, my husband Jesse and good friend Nate road in the Ride to Defeat ALS in Napa Valley with Team Mazzetti. Even though I did not participate I was very glad I went for many reasons. It was a great experience for our family, as well as seeing my husband's co-workers/friends ride together as a team. My children and I slept in while my husband woke up early in the wee hours of the morning to meet up with his team at the starting line. We had spent the night in the Napa Valley region so there was no risk being late! In the late morning my kids and I headed over to the Calistoga Area to wait at one of the rest stops. I had been following my husband on a new iPhone app called "Find Friends" but I don't know if I misread the map or GPS but I couldn't figure out where Team Mazzetti was. The kids had been away from daddy all day and they were having "daddy withdrawals", so we made sure the kids got lots of hugs from Jesse. One of the team members could no longer ride, so after we said our goodbyes we shuttled him back to the finish line at the Yountville Veterans Home. I had been to two rest stops and later at the finish line...the one thing that amazed and inspired me was a particular family who had a sign that said, "You are doing this for my daddy!!" and it literally broke my heart. At the same time it brought the significance of the ride, that this was not a race but truly a ride to defeat ALS. Not only were the families present but people with minor ALS were participating in the ride as well as being present at the finish line. Over the past couple of months, it has come to our attention that family members of our friends have passed away from ALS. Jason Fried, a fellow outdoor family blogger (1 Quest 2 The Next), was open enough to share with me that his father passed away NINE WEEKS after he was diagnosed with ALS, nine weeks.... Another friend of ours, Kevin shared with my husband that at the age of 12, his mother passed away from the "horrible condition" after six years of battling with ALS. This whole process has changed my significance of races with running, riding, etc., to truly finding the meaning behind these activities. 60 Miles - Family Rider!! If anyone knows the family pictured above, please forward the link to them and pass on my email to them: melissa@chasquimom.com. I think I had tears in my eyes the entire time we waited for Team Mazzetti. With every rider came cheers, hugs and riders almost passing out! Teenagers, women, men, elderly riders crossed the finish line all with smiles on their faces, some riders saying the ride's motto "NEVER GIVE UP". My kids played in the leaves, climbed trees for and hour and a half while we waited for Team Mazzetti to finish. At last, one by one Team Mazzetti came in and all of their FIRST Century Ride was over. My kids were happy to have their daddy back, Team Mazzetti was happy to have finished, and I was happy to have seen this great ride. This has left me with the desired to ride next years Ride to Defeat ALS with my kids! My goal is to ride the 27 mile ride towing my two kids, while my husband does the Century Ride and not only for the fun of it but because it is truly a great way to support this cause. Thank you to all who supported us by donating financially, both Jesse and Nate met their fundraising goals as well as Team Mazzetti raised over $2,000 combined! Thank you all who supported us with giving us a place to stay, prayers and sending good vibes! I truly pray and hope someday there is a way to Defeat ALS as well as other health issues that plague our communities like cancer, mental illness and many others. Looking forward to next year's Ride to Defeat ALS! To read about an actual riders point of view, please visit Nate Rische's post "Road Race Report: It's Supposed to Hurt Like Hell!" on The Absence of Something Substantial. Climbing For My Son's Sake! I've been blessed with a never-ending energetic spirited son. I knew there was something different about my son since birth. He never stops moving, I mean NEVER and if he does it is because he is really sick. I think I've only met a handful of kids like him in his three years of life. Not only does my son have the "fountain of never-ending energy" but he is also very intense in everything he does. Whether he's playing a game, hiking, putting on his shoes, he does everything with every shred of energy and emotion in his little body. Over this past summer, I was becoming a little frustrated and running out of ideas of how to drain his energy other than hiking. He's starting to learn to ride his bike, but the learning curve is so steep right now that it just leads to a frustrated toddler still full of energy. I considered swimming classes but it would be only once a week and I needed something to drain his energy now, something he could do right now without having to learn a new skill. Playgrounds usually ended up with both of my kids crying because they would not want to leave, not being able to play with other kids toys or just "playground politics" (mother's scared of their kids getting dirty, kids not behaving, etc...). I rather take my kids to Nature's real playground than a regular kid playgrounds. One Sunday after church, in my frustration and embarrassment of finding him almost to the top of the 10-foot speaker (the service was over thankfully) it finally hit me, he loves to climb! After I pulled him down from the speaker, I started entertaining the idea of joining our local climbing gym. It's like those moments in a movie where the main character has flashbacks to all the situations that led them to a giant revelation ala "Sixth Sense", and I remembered every time I found my son climbing something. In particular, on a trip to Pinnacles National Park my son saw some people climbing for the first time and he asked me what they were doing and I told him that they were rock climbing. His eyes opened up like it was Christmas morning and he said, "Mommy I want to rock climb!!!" and took running off down the path towards the climbers. I did some online research as any mom does nowadays and started suggesting the idea to my husband to join City Beach Rock Gym. It took a little convincing my husband but after a very frustrating day with our son, we headed off to City Beach and my son and I became members! There are other lessons he is learning like learning to fail, waiting and his physical limitations. I too am learning to climb for my son's sake! Just until last week did my husband and I learned to belay, which opens up much more of the gym to us and I'm pretty sure to say that my husband and I are hooked. Personally, climbing is something I'm learning for my son but I'm finding real enjoyment in it's physicality and the puzzle-like nature that my "accounting" brain likes. We do everything as a family, that is part of being a Latino family (well half)....the way we roll! Currently we are beginning climbers, we do not have any of our own climbing gear. We use the rental gear from City Beach which is fine during this juncture in our climbing life. We eventually want to do outdoor climbing but not anytime soon because of our inexperience and mostly lack of gear. Once we feel comfortable with indoor climbing then we will venture in the world of outdoor climbing, which could add a WHOLE new aspect our day hiking and backpacking trips. Climbing in the outdoors is a new family dream that we will make come true for our little boy one day. I'm very glad to have a great circle of family-oriented outdoor community that I can go to with all my climbing questions and in general outdoor activities! You can visit all my recommended outdoor resource page HERE. It's going to be a great ride to learn how to climb but I'm glad our son pushed us into the world of climbing. Cheers my to little boy! It has been one year since I started "Chasqui Mom" and it's been quite fun. Last August, I entered into the world of blogging because I wanted to share about our love of the outdoors with others. Many times our friends and other hikers would ask us, "Well, how do you hike with a toddler and a baby?" and I'd thought having a blog would be a great way to share with friends and others how to enjoy the outdoors as a family. Believe me, its been a great growing relationship between myself, the outdoors and parenthood. Chasqui Mom hasn't always been Chasqui Mom! Like many new mothers I was very timid about introducing my babies into the outdoors but with the help of my super energetic son and my dirt-loving daughter, my children turned me into Chasqui Mom. Over the last year, Chasqui Mom and family have spent many days and nights camping, backpacking, hiking as well as starting an outdoor wilderness program with the church youth group we lead . We have visited six national parks, four California State Parks, two National Forrest, eleven local parks and one international country! On +Google+, the awesome Thru-Hiking Community that has over 5,000 members! A great network of other outdoor family bloggers on Outdoor Blogger Network. Partnering with Latino Outdoors, a San Francisco Bay Area organization working in motivating Latinos and Latino families to get outdoors. As well as playing +Capture California's, outdoor social media game. I love California and this is a great game to enjoy the outdoor California! One year has brought on 79 posts, lots of outdoor adventures, new friends and great family time. Here's to the next year of blogging and who knows what other fantastic adventures Chasqui Mom and family will have! Motherhood is hard but it's the good days like today that make me so confident in the steps that I have taken in my life to be able to be a Stay-At-Home-Mom (SAHM). Nothing exciting today, no hiking, no trips to a special place, just a morning at home with a trip to Food Maxx. I love being with this kiddos, being able to hear their side conversations, giving endless hugs all day long, hearing my 20 month old daughter count how many nectarines are going into the bag. I realized that I have two more years until my little boy starts going to school and that almost brought me to tears at Food Maxx today. So on days when I feel like I can't handle being a SAHM, I will remember days like today, a happy trip to Food Maxx. Why wouldn't I love to cuddle with my Cheeto's covered sleeping daughter? Nineteen months old is pretty young to visit the dentist, but Sophia had a little tumble on Friday morning and broke a chunk off of her upper front right tooth. It wasn't even a rough fall, she fell right at the right angle, mouth open on our kitchen floor. I actually found the piece of her tooth on the floor! There was minimal bleeding but I still wanted to take her to the dentist to make sure everything was fine. 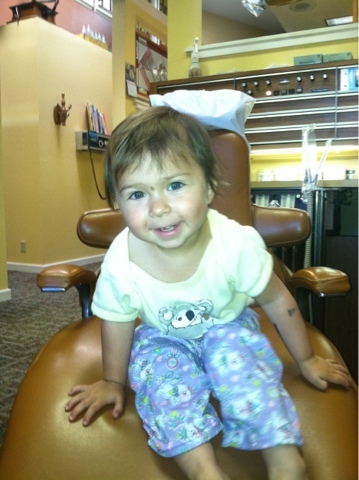 Sophia thought the patient chair was a slide so she slid down a few times until Dr. Spillner showed up. Sophia was happy until Dr. Spillner put on his face mask then screamed the rest of the examination. Results are her tooth is fine but her tooth could still die from the impact within a year. She may also have a higher chance a getting a cavity in her tooth since the whole tooth isn't covered by enamel. Ah more worries for mommy. I grew up with dental issues so I understand the how it is to visit a dentist at a very young age. As any parent knows, children always bring out your own flaws. One thing I've always struggled with is vanity. I want to look nice, put together, wear nice clothes and pretty much look good. One thing motherhood did for me is strip that away from me! No more 2-3 hours spent everyday doing my makeup and hair! But I still want my children to look good because its a reflection on me. My daughter was also born with a little birthmark right in between her eyebrows and for a while it really bothered me until I fully understood that it the way God created my little girl and made her perfect in His image. I get to speak to lots of Indian women because they are intrigued by Sophia's birthmark. My aunt actually has the same birthmark but it blends into her tan skin but was so honored that her great-niece in America (my aunt lives in Peru) has her same birthmark. I know my daughter is beautiful but for a few hours after she broke her tooth it really bothered me in the same way as her birthmark did. Thinking...."kids will make fun of her....it will reflect bad on me..." but that is how vanity tries to sneak back into my life. I love my baby girl and is even more beautiful with her broken tooth, because it brought to my attention that I was projecting vanity on my children which is something I do not want. 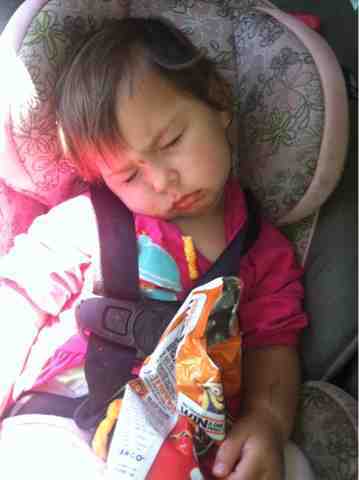 I'm over it, my daughter even at 19 months is a tough little girl hence that is why we nicknamed her "Mountain Baby". My daughter is the girly girl loves tutus, princesses, anything pink but asks to go hiking when daddy gets home, loves being outdoors, doesn't even get phased when she got hit in the head with a fire log by her big brother (yes that really happened). So cheers to a broken tooth! Nap time is always a struggle in my household when it comes to my son, so when we hike I really don't care if he naps or not. Some parents are more rigid when it comes to napping but I am a little more "go with the flow" when it comes nap time for our toddlers. Here's my son trying not to nap at Pinnacles National Park. I grew up as "Pastor's Kid" so I was taken everywhere and anywhere growing up, falling asleep at restaurant booths, park benches, church with loud music playing etc. Our current family lifestyle is almost the same, we are a family that can never sit still so my kids sleep anywhere, church benches, the floor, especially their carriers while hiking. Every parent has different parenting styles, but some great motherly advice from my mother was that children should adapt to their parents lifestyles not the other way around. Happy Hiking! Complete the East Bay Regional Parks District, 2013 Trails Challenge. Only three more hikes to go! Go on our first family backpacking trip. Take my very first Kayaking class. Take a family snowshoeing class as soon as Sophia turns two years old (REI provides a family class but the youngest child has to be at least two). Hike the entire Pacific Crest Trail, Tahoe Rim Trail and Bay Area Ridge Trail. Visit every American National Park. Last weekend we did not have a chance to go hike, so by Monday morning my kids were a little too energetic for this stay-at-home-mom. I had been contemplating for the past couple of weeks to go hiking alone with my toddlers (three and one year old) because sometimes the children's parks and neighborhood walks are not enough for my kids. I decided to "bite the bullet" and take my kids, David and Sophia, to Coyote Hills Regional Park and might as well complete my first hike of 2013 Trails Challenge of the East Bay Regional Parks District. I decided to do one of the hikes marked as "Easy-2.5 miles" since I've never been hiking alone with my kids. It took me almost all morning to get ready, tummies needed to be filled before we left and as well as preparing lunch for the hike. One of the many important things, I have learned as a parent is it takes a really long time to leave to go anywhere, so if I can mentally prepare myself for it then preparation time is not stressful. The drive into Coyote Hills was beautiful, the hills were green, skies were blue and a beautiful field of yellow flowers filled the street that turned down to Coyote Hills entrance. I wanted to stop and take pictures but Sophia looked a little sleepy and I wanted to start hiking before she fell asleep. An eternity to pack up to get out of the house also leads to an eternity to get out of the car to start hiking. I wanted to pick up our Trails Challenge T-Shirts but I did not know that Coyote Hills Visitor Center was closed on Monday's. We started our hike as listed on the Trails Challenge on Bayview Trail near the Visitors Center, but did the trail in reverse order. I brought our double jogging stroller just in case the kids got tired but after this hike I will no longer bring it along, my kids are hikers not sitters. Sophia taking the view of the Main Marsh and Mission Peak in the background. We hiked along Bayview Trails towards Lizard Rock Trail but on the 0.17 miles there Sophia got cranky, wanted to be carried and David wanted a snack. I convinced my kids to sit in the stroller with some banana chips, one of their favorite snacks. A view of the North Mash and in the very far off distance in the Hayward hills is California State University Hayward, (my alma mater) now CSU East Bay. There are two Lizard Rock trails one for hikers only and the other for hikers and bikers. Is a jogging stroller considered a bike? Either way I just followed the tire marks in the trail and took the wider Lizard Rock Trail. Sometimes I can not believe I'm a mother of these two beautiful kids. I truly love them so much. I saw this beautiful big tree on Lizard Rock Trail and and to plop them right in front of it for a picture. The trail was bumpy so the kids really enjoyed all the jostling and it made them down right sleepy. We headed down towards the Main Marsh again where I found something new that caught my eye. Granted this is our second year doing the Trails Challenge but it was nice to see the trail markers marked as part of the trails challenge. Bright green to catch my eye! Tried to take a picture of myself with my kids but they can never sit still, so here's a solo one of myself. The Visitor Center is to the left of the picture with the Main Marsh right behind me. We made a quick right onto Muskrat Trail where we spent a very long time. The kids saw the marsh that followed along the D.U.S.T. Trail and both screamed "Me Stuck!! Out!!" A fellow hiker told me there were large fish in the water and the kids excitement went through the roof. We sat there near the marsh as Sophia "threw rocks" into the marsh, lets just say the rocks never made it to the water. That morning David had watched "Go, Diego Go" and watched Diego save a whale, therefore he asked me to see the whales and I told him maybe we could see the Bay (the ocean) and see some animals. David was determined to see a whale. The imagination and hope of a three year old is quite refreshing sometimes. As we sat by the marsh all of a sudden five large fish started splashing just underneath the surface of the water. The kids didn't know what to make of it and I explained that the fishes were swimming, but a few minutes later one large fish literally jumped out of the water three times in a row right in front of us. David nearly died of excitement, I've never heard him squeal so much before. It almost brings tears to my eyes remembering his face and him squealing, "Mommy a BIG fish, it's a whale!!" Sophia also saw the fish and was more scared than anything else, she needed a big hug. After the excitement of the "whale" subsided, David wanted to move on but Miss Sophia could sit near the marsh all day long so I convinced to sit in the stroller for five minutes with some cheese sticks. Down Muskrat Trail towards Chochenyo Trail, where the cotton tail plants were as tall as I am, five feet tall. There were "fuzzies" floating in the air from the cotton tails and some other flowering plant, which looked like snowflakes drifting. David comes to the realization that it's "snowing" and Sophia starts babbling, "snow, snow, snow..." Who am I to burst their bubble and agree that it's snowing in 70 degree weather in Fremont. Mother's love. Sophia was being silly, she does not have the energy level as our son so she took a break by laying down in the trail, face in the ground on Chochenyo Trail. Everyone wanted a little break so I decided to break out the good stuff, Trader Joe's Salami, some more cheese, cherry tomatoes and banana chips. David taking a break and apparently sunning himself on the trail. After lunch time we made it down to the end of the trail at the far end of this picture above. Sophia got really cranky by this point so I put her in my baby sling and tried to convinced David to get in the stroller. It was so obvious that David was really tired but every time I asked if he wanted to sit down he would say, "No, Mommy. I walk." This is when I decided that I would no longer take our jogging stroller on hikes. It was absolutely useless, David sat in it for 10 minutes and Sophia an additional 5 minutes. The rest of the time they hiked and I really realized that my babies are outdoor kids. Hence we nickname Sophia "Mountain Baby" last summer after we visited Highland Lakes in Northern California. Sophia quickly fell asleep in my sling and David and I continued onto Tuibun Trail which turned into Bayview Trail which followed along the Main Marsh. I didn't bring any chocolate on this hike so I bribed him to keep hiking with the promise of chocolate when we got home. It was a very fun hike and more importantly the kids had a blast and burned some energy. My GPS Garmin had a little difficulty but we were not 250 feet below sea level. We hike 2.6 miles or an average 1.8 mph in 3 hours. Hiking with little ones is really slow. Hardly any elevation change, started at sea level and barely reach 50 ft elevation. My first "alone" hike with the kids! Where Did We Go in 2012? Two thousand twelve has been great! The only thing I wish that was different as many parents of little ones wish they could have was more sleep!! Praying that in 2013 my prayer is answered. Here's a recap of what 2012 brought us. January 2012 - Still trying to get the hang of being parents of two little ones, this was my daughters FIRST hike at Coyote Hills Regional Park in Fremont. She was barely three months old. February 2012 - We headed out to one of the 60 Bay Area Hikes on our list. San Bruno Mountain State Park. It was a gorgeous day, first time I was able to see the Pacific Ocean and the entire Bay Area. March 2012 - Oh March, took us to one of God's most beautiful places in the world, Hawaii. I still haven't had a chance to blog about our Hawaii trip. This is Beach 69 on the Big Island. I fell in love with snorkeling. April 2012 - My husband and I are Youth Leaders at our church, and we took our youth group an awesome youth conference called Planet Wisdom. May 2012 - This year I turned 30 and loving it!! June 2012 - We led a youth missionary trip to Ensenada, Mexico, where we served our fellow Mexican brothers and sisters. We camped at at Rancho el Refugio for one week. July 2012 - We enjoyed camping at Sunset State Beach over the weekend with our church family. August 2012 - Brought us to Highland Lakes, where we camped and hardly hiked due to being so sick. We later made up for no hiking at Highland Lakes with a hike at Jack London State Historic Park. September 2012 - My first half marathon, San Francisco Giants Half Marathon. I don't even know my exact statistics but I think I finished in 2 hours and 25 minutes or something like that. I was just glad to be finished. It was really awesome. We also celebrated my little girl's First Birthday!! October 2012 - Hiking at my favorite hike of this year, Portola Redwoods State Park. My kids LOVED this hike! November 2012 - We found a little gem east bay park, Dublin Hills Regional Park. It was amazing to see how many people loved this picture on Facebook and Instagram. People thought I went out of the country, haha. December 2012 - We went on a mini mission trip, where my husband did his Engineering work at Rancho El Refugio and we visited our local pastors. We also had the joy of celebrating my little boy's 3rd Birthday!! I also haven't had a chance to blog about our Disneyland adventure. I always tell my husband that we need to travel more but as I write this posting I notice that we do travel a lot. I guess we like to travel and have family adventures. The one thing I can say is that God is very good to us by allowing us to see the world He created and I can't wait to see what He will have in store for us in 2013. Happy New Year! !